You can start giving now! Have you dreamed of making history? Of course, we all have. And now we have a chance to be a part of greater New Haven’s day of giving, The Great Give®—an opportunity to unite our community around causes in which we truly believe and help nonprofit organizations connect to the larger community. We need your help! Please join our campaign and help us raise the money necessary to continue—and expand—our programming and preserve—and expand!—our incredible film archive! We need you to tell your friends and family members about the value we have for the community and ask them to join us in helping to make a difference. The Great Give®, organized by the Community Foundation for Greater New Haven, runs from May 1-May 2, 2019 from 8:00 a.m. to 8:00 p.m.. Advance gifts can be made for The Great Give® beginning April 19, 2019; advance gifts will count toward grand prize calculations, but will not be counted toward hourly prize incentives. 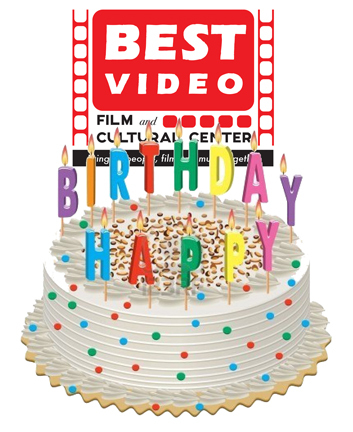 To contribute to Best Video Film & Cultural Center during The Great Give®, go to TheGreatGive.org and enter “Best Video” in the Search field to find our page. Or just click on the graphic in this post to be taken directly to our Great Give® page. BVFCC will endeavor to stoke enthusiasm for The Great Give® with two Happy Hour events, one on Wed., Apr. 24, from 5-7 PM, and the second on the first day of The Great Give®, Wed., May 1, from 5-7 PM. Come on down to BVFCC on those days for drink specials, tasty snacks, socializing, and—if you can—your laptop or smartphone to make a Great Give® donation to support BVFCC! Have you dreamed of making history? Of course, we all have. And now we have a chance to be a part of greater New Haven’s day of giving—an opportunity to unite our community around causes in which we truly believe and help nonprofit organizations connect to the larger community. The Great Give® is BVFCC’s major spring fundraiser—help us make it a successful one to strengthen our bottom line for the rest of the year. Get ready to give! 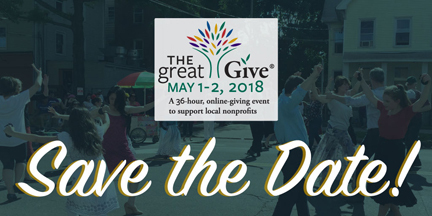 On May 1-May 2, starting at 8AM on May 1, visit The Great Give® and make a donation to us and/or to any of the great participating nonprofit organizations in greater New Haven. You will have 36 hours to make your donation, and all giving will end at 7:59PM on May 2. As part of our The Great Give® campaign, we will host two Happy Hours at BVFCC on consecutive Tuesdays, Apr. 24 and May 1. Starting on Apr. 23, supporters can schedule their donations in advance if they think they may be unable to participate in The Great Give® during the official 36-hour event. And on Tuesday, May 1, we will try and shoot for the $1,000 Happy Hour Prize for the most individual donors between 5 and 7 PM on that day. Come to BVFCC for each Happy Hour and enjoy snacks, schmoozing and reduced price drinks at our cafe. Per above, The Great Give® takes place online over 36 hours Tuesday through Wednesday, May 1-2. Online giving is where most of the action is for this fundraising marathon organized by the Community Foundation for Greater New Haven. But here at Best Video Film & Cultural Center, we like to encourage real world, interpersonal interaction, too. As part of that, we are holding two Happy Hours—on Tuesday, Apr. 24, and Tuesday, May 1—to stoke enthusiasm for The Great Give®—and have fun at the same time. Come join us at BVFCC on Tuesday, Apr. 24, from 5-7 PM for our The Great Give® Kick-Off Happy Hour. We’ll have munchies, drink specials and neighborliness. And if you think you won’t be able to give during the Great Give®’s 36-hour window, we can tell you how you can schedule your gift in advance. And then stick around, if you like, for the Stacy Phillips & His Bluegrass Characters show that starts at 7:30 PM. 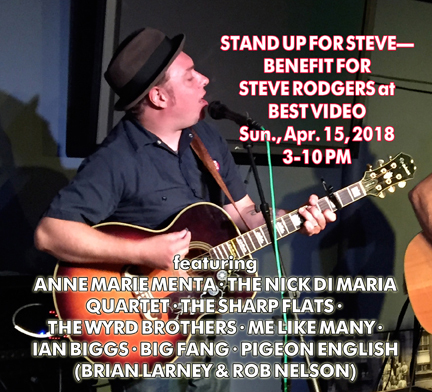 Best Video Performance Space is proud to be hosting a benefit for Steve Rodgers, former owner of The Space, The Outer Space and The Ballroom. The event—which feature a diverse lineup of nine musical acts—will be held this Sunday, Apr. 15, from 3-10 PM. Suggested donation is $10 – give what you can! A parallel event will also be held at Toad’s Place; paying the donation can get you into both events. Steve Rodgers has been a pivotal figure in the greater New Haven music scene since his days in the 1990s leading the group Mighty Purple with his brother Jonny. As proprietor of the all-ages The Space—and, more recently also The Outer Space and The Ballroom—Steve has worked day and night to provide a welcoming venue for local music in an array of genres. But Steve’s efforts have come at some cost to himself, both in terms of debt and a toll on his personal health. Now that he has ceded ownership of the venues, members of the local music community are coming together to raise funds to help out Steve in this time of transition. Despite the fact that Steve could have seen the creation of Best Video Performance Space as a rival, he was nothing but supportive of our efforts. Steve went so far as to lend us—at no charge—a PA mixer when our first one went on the fritz. We are honored to be able to help out. Please join us on Saturday, November 18, 2017, from 7-10 PM, in celebration of the second anniversary of Best Video Film and Cultural Center (BVFCC), a non-profit created to preserve Best Video’s rich archive and explore new ways to bring people, film, and music together. The celebration will take place at The Ballroom at The Outer Space in Hamden. Tickets are $25 but please consider making a donation over and above that amount. Supporters who donate over $100 — or have donated over $100 this year — will receive complementary admission to the show. Donations in excess of the value of admission are tax-deductible as allowed by law. You can purchase tickets online here. BVFCC was officially recognized as a tax-deductible non-profit by the IRS in 2016. We have increased our programming with over 120 music events; more film screenings with larger turnouts and great discussions; more lectures on films by Yale Prof. Mark Schenker; and increased use of the Performance Space by community groups. We organized a film festival — BestFest Student Films, which had its initial event on Dec. 10, 2016 — to showcase the work of local high school students. In addition, educators and filmmakers involved in the organizing of BestFest Student Films offered several free filmmaking workshops for students. A lineup of superb local artists have offered to donate their talent for this event: bluegrass group Five in the Chamber, klezmer big band Nu Haven Kapelye, indie rock chamber group Olive Tiger, and the string quartet rock band The Tet Offensive. 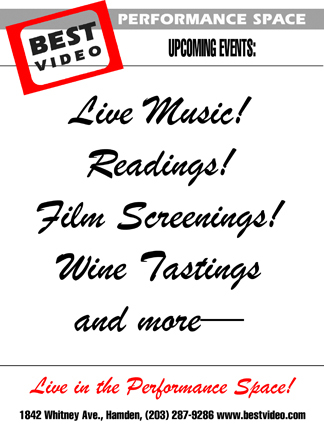 We will also be showing locally made short films between musical acts. Steve Rodgers, owner of The Space and The Outer Space, has generously donated use of The Ballroom for our gala event. Best Video Film and Cultural Center (“BVFCC”) was created to preserve Best Video’s rich archive and explore new ways to bring people, film, and music together. 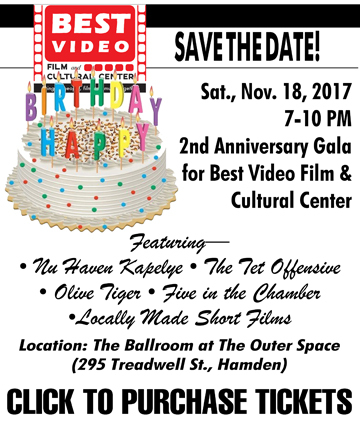 On November 1, 2016, BVFCC took over BEST VIDEO, a valued community space serving Greater New Haven with its world class film archive, performance space and coffee bar. The entire film archive — one of the finest such collections in the country — remains in place and continues to grow with additions of more foreign and domestic films, documentaries, and television series. In addition, the music events, film screenings and other presentations in the performance space have been expanded to reach a broader community audience. Our goal is to bring good movies and good people together. For customers who like the way we do that now, nothing will change. For just a few dollars, you will still be able to rent any movie in our archive. However, we now offer new membership formats that we believe better serve BEST VIDEO’s diverse customers and provide more value and simpler access to our expansive archive and our music and film events. We invite the support of every member of the BEST VIDEO family. If you are unable to make it to the concert, please consider making a donation. All amounts are greatly appreciated. We look forward to the participation of all of our existing members and are excited to welcome new members to our family as we continue in our efforts to enrich the cultural wealth of the greater New Haven region. BVFCC Appeal an ongoing success—over $30,000 raised! We are humbled and grateful for the tremendous outpouring of support and love—there really is no other word for it—that we have received from the community since we made our appeal for donations and memberships. The “official” campaign, as defined by the Facebook event we created, lasted through last Tuesday, August 29. But we continue to get new households joining up for our monthly or annual membership plans. As of mid-day Monday, September 4, we have raised over $30,000 through donations and supporters signing up for new memberships or upgrading the plans they already have. We have added almost 100 new members. If you haven’t already joined one of the plans but would like to, you can do so at this link or in person at Best Video Film & Cultural Center. If you would like to donate, you can do so at this link or in person at Best Video Film & Cultural Center. We are deeply grateful and humbled by the community’s support. Without a groundswell of support, Best Video faces the very real threat of having to shut our doors. What happens in the very near future will determine whether Best Video Film and Cultural Center will close, will limp along, or will soar. 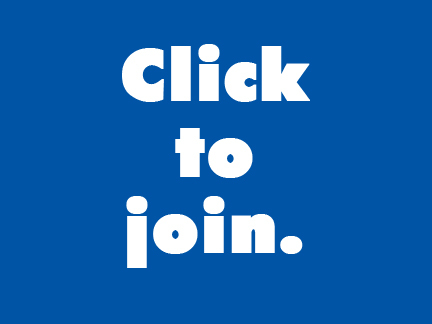 • If you are not already a member, become a member today by signing up online or coming into our space. Programming director Hank Hoffman suggests a target of 200 additional members over the next few months in order to have enough recurring revenue to cover our current operating expenses. • Make a donation online (or in person). General manager Richard Brown says raising $20,000 would catch us up with bills currently owed to vendors. Even better, BVFCC Board of Directors President David Margolis points out that raising $50,000 would enable us to also pay off the remaining debt to Best Video founder Hank Paper and establish a financial cushion that would facilitate expanded community programming and improvements to the physical space. After more than a year-and-a-half of operation, BVFCC is proud of the community support that has carried us this far. We have already raised over $35,000 in donations in the fiscal year beginning October 2016. Of particular note as a marker of the value the community places on Best Video, is this year’s performance in The Great Give, the May online charity marathon organized by the Community Foundation for Greater New Haven. Out of some 500 worthy nonprofits, BVFCC finished in the Top 10 in number of individual donors and in the Top 25 in total contributions. Unfortunately, despite our successes, when it comes to bringing in enough income to cover our expenses and pay off our debts, we are falling short. We have a 2nd Anniversary Gala celebration planned for November. We had hoped to get to that event without calling on the public but a slower than expected summer necessitates this appeal. Presenting programming to delight and educate the community. Dr. Caterwaul’s Cadre of Clairvoyant Claptraps playing music from “The Simpsons” TV show to a sold-out crowd this past July. When we opened as a nonprofit in November 2015, we knew that the traditional video rental model was not viable. For several years leading up to Hank Paper’s sale of Best Video’s assets to BVFCC, rental income was decreasing by 20% a year. Anticipating that the trend would continue, we started offering annual membership plans. With membership plans starting at $10 per month, we projected that if we can reach 700-1,000 members by the end of the third year, we would be able to replace the rental income with membership revenue. The good news is that almost 370 households have signed up for one of the three membership plans. The bad news is that—for BVFCC not to run into recurrent cash flow crises and, ultimately, face the awful decision to close—we need 200-500 more member households. 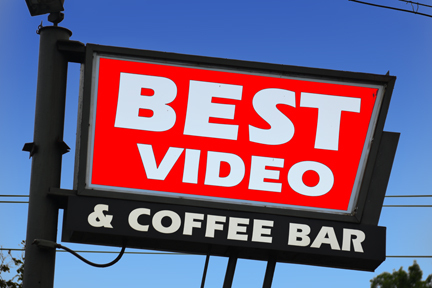 If BVFCC were just a “video store,” we would have closed years ago. And perhaps deservedly so. But BVFCC is much more than that. It is a community gathering place, a performance venue, a film screening room, a national-level archive of the history of cinema, and a safe place for neighborhood children to come and hang out after school. It is a place where people, film, and music come together. BVFCC exists bring people, film, and music together.Pre-Oscars Brunch this past February. When you are a member of Best Video Film & Cultural Center—whether you pay on a recurring monthly basis or get a 10% discount by paying annually—BVFCC becomes your library of film. Depending on your level of membership, you get free admission to from 1-4 shows per month. Most importantly, you are part of a community dedicated to keeping BVFCC as an essential part of the cultural wealth of the greater New Haven area. 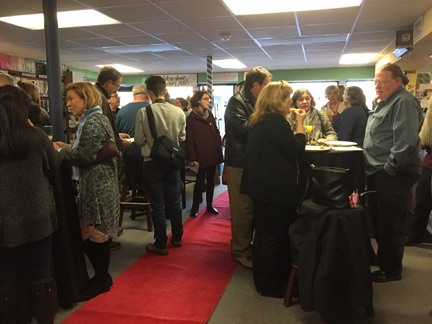 The red carpet rolls out when Best Video Film & Cultural Center hosts an afternoon Oscars brunch and fundraiser on Sunday, Feb. 26, from 4-6 PM. It’s the perfect event to get ready for the evening Academy Awards ceremony. 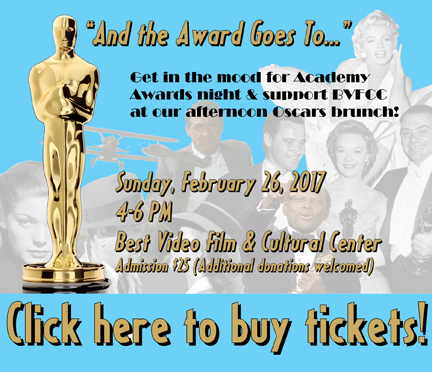 The Oscars brunch will be held at BVFCC, located at 1842 Whitney Avenue in Hamden. Admission includes mimosas, a bagel bar, quiche and assorted desserts. Jazz duo Joe Carter (guitar) and Tim Moran (sax and flute) will provide background music. 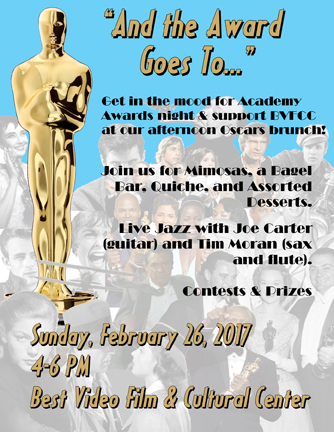 Each attendee will be given an Oscar ballot to fill out with great prizes for those who correctly choose the most winners. Among the prizes are a $100 Wave Gallery gift card and a $100 Café Amici gift certificate. Drawings for door prizes will also be held throughout the event. Tickets are $25 in advance—available at BVFCC or online through Brown Paper Tickets—or $30 at the door. Additional tax-deductible donations above the cost of the ticket are welcomed. Please join us on Thursday, November 10, 2016, from 7—10 PM, in celebration of the first anniversary of Best Video Film and Cultural Center (BVFCC), a non-profit created to preserve Best Video’s rich archive and explore new ways to bring people, film, and music together. On November 1, 2016, BVFCC purchased Best Video from founder Hank Paper and began running it as a cultural non-profit. The celebration will take place at The Ballroom at The Outer Space in Hamden. • A lineup of superb local artists have offered to donate their talent for this event: jazz group Jeff Fuller & Friends, indie rock group Mercy Choir, roots rock trio The Bandidos and swing/blues group The Red Hots. • We will be showing some locally made short films. • There will also be munchies—wings, cheese platter, veggies and hummus, bruschetta. Tickets are $25 but please consider making a donation over and above that amount. Supporters who donate over $100 will receive complimentary admission to the show. Donations in excess of the value of admission are tax-deductible as allowed by law. Or, you can purchase tickets at BVFCC at 1842 Whitney Avenue in Hamden. Tickets will also be available at the door. If you can afford to make a donation over and above the ticket price, it is both tax-deductible and much appreciate. It is support like that which has enabled us to maintain the archive and expand our programming! • BVFCC was officially recognized as a tax-deductible non-profit by the IRS. 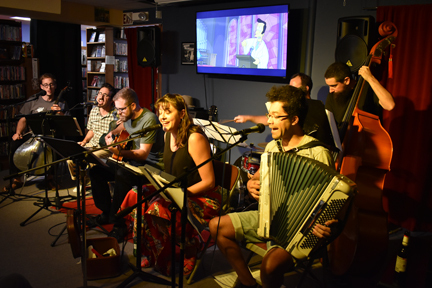 • We have increased our programming with over 120 music events; more film screenings with larger turnouts and great discussions;more lectures on films by Yale Prof. Mark Schenker; and increased use of the Performance Space by community groups. • We have organized a film festival — BestFest Student Films — to showcase the work of local high school students this fall. Steve Rodgers, owner of The Space and The Outer Space, has generously donated use of The Ballroom for our inaugural event. The entire film archive — one of the finest such collections in the country – remains in place and continues to grow with additions of more foreign and domestic films, documentaries, and television series. In addition, the music events, film screenings and other presentations in the performance space have been expanded to reach a broader community audience. Our goal is to bring good movies and good people together. For customers who like the way we do that now, nothing will change. For just a few dollars, you will still be able to rent any movie in our archive. However, we now offer new membership formats that we believe better serve BEST VIDEO’s diverse customers and provide more value and simpler access to our expansive archive. For the benefit of Best Video Film & Cultural Center, we present “Vino Paradiso” on Wednesday, Oct. 5, from 5:30—7:30 PM. 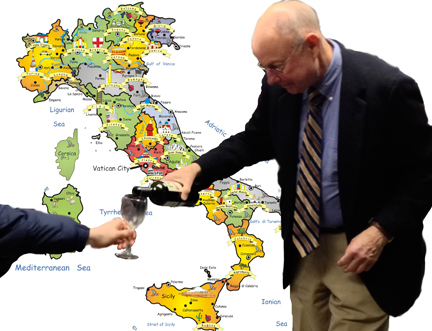 “Vino Paradiso” will be a wine tasting (with hors d’oeuvres served) led by Bob Feinn from Mt Carmel Wine and Spirits and local wine wholesalers in the round. Tickets are $25 per person. Call BVFCC at (203) 287-9286 for reservations. What better way to support your local grassroots cultural center than with a joyous evening sampling and learning about fine wines from local experts? Attendees have raved about our previous wine-tasting events and we expect this one to raise the oenophile bar. BVFCC supporters Chris, Michael and Marianna (Michael’s sister) adopted September as their month to serve as BEST Ambassadors, holding a tag sale that raised nearly $600 for BVFCC this past Saturday (Sept. 10) and spreading the word about membership and upcoming programing. They now challenge YOU to be BVFCC Ambassador for a month!! • What is a BEST Ambassador? BEST Ambassadors adopt a month during which they will spearhead some kind of fundraising, friendraising (awareness counts too!!) and publicity event of their own design. 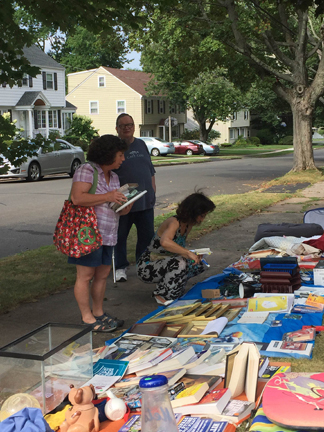 Chris and Michael, recent empty-nesters, wanted to find good homes for their accumulated stuff, but the motivation to organize a tag sale was lacking. When Marianna suggested they become BEST Ambassadors for September, and donate 100% of the proceeds of a tag sale to BVFCC, they had all the motivation they needed! Attached are early morning photos of the set-up before the bargain hunters began to stream in. 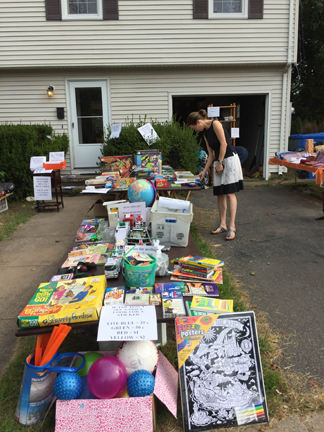 Chris and Michael’s house is now pristine, their stuff has found new life, BVFCC is nearly $600 richer, and more people know about this neighborhood treasure — a win-win!!! • Chris and Michael challenge you to meet or beat this first showing! What fun, creative, useful project or event can you organize that will raise some money and spread the word beyond the current circle of BVFCC supporters? Perhaps October’s BEST Ambassadors will host a “dress your pet like your favorite movie star” contest in honor of Halloween, with a $15 fee to enter your pet, and a local celebrity judge. How about a chili cookoff as we move into colder weather in November? Movie aficionados might enjoy a movie trivia night where teams pay to compete. Throw in a 50-50 raffle at your event to generate a little more income! Use your imagination, and use social media so that the friends of the friends of the friends of BVFCC hear about your event and come just for the fun of it. So pick a month and let BVFCC staffers Hank Hoffman or Richard Brown know about your planned event so it can be advertised in store communications. It would be great to have multiple ambassadors holding multiple events in any given month. Chris, Michael and Marianna are happy to share ideas and suggestions. We want this weekend’s tag sale to be just the first in a long list of events that put the fun in fundraising!